Is Climate Change the new Gay Marriage? This may seem odd, but the shifts in public opinion and the growing change in GOP official responses to questions about climate change sure looks a lot like gay marriage a few years back. For instance, a NY Times article discusses why many GOP candidates respond to questions about climate change with “I’m not a scientist.” (Well, yeah, we’ve noticed, guys; nor are most of you female or OB-GYNs but that hasn’t stopped some strange speech about abortion). In the past the answers were more along the lines of “the science is still in doubt” or even “I don’t think there is climate change, it is a hoax perpetrated by scientists trying to get more money.” Why the shift? They are probably seeing polls like one reported in the Times, where 71% of Americans think they are seeing signs of climate change and 55% say we should do something to reduce greenhouse gas emissions–this in a nation whose Protestants still believe in ghosts more than evolution. They are probably also noticing that some of their major corporate donors are acknowledging the science and planning on there being a carbon tax or something equivalent. Just as with gay marriage, this feels like a case of the public leading the politicians. If the economy becomes a non-issue in 2016 it could well be that being a climate change denier/doubter/agnostic might be a big political liability. So, for now, the GOP is hiding. The sooner they come out of hiding and decide to try to do something about this, the better. And hey, if they want to polish their climate-change credentials if they control Congress in the next 2 years, so much the better. One of the seminal events in US history was the discovery of gold in California and the massive amounts of the yellow metal that were infused into the US economy (not to mention the upheavals in California itself). There has been some mystery about the source of all this gold; a few things about this cropped up at GSA last week. First off, Erin Marsh gave an initial exploration of the source of some of the paleoplacer gold in the Auriferous Gravels. Although many workers had noted that the Eocene deposits only had gold downstream of lode gold deposits, there has bent he suspicion that some of this gold had come in from the east, perhaps even derived from the Carlin-type gold deposits in eastern Nevada. The limited work to date tends to confirm that the Auriferous Gravel gold is locally sourced, having about the same chemical composition and with similar kinds of associated quartz. Ryan Taylor spoke on the tectonic conditions associated with the emplacement of the lode gold. Dating gold deposits has always been a bit tricky as the gold itself is not datable, so dates are coming from associated minerals in the veins with the gold. In some instances the phase is monazite, other places the mariposite within the quartz veins can be dated. Although the dates range from 160-110 Ma, most of the dates land in the 130-120 Ma range. Much of this talk was focusing on the nature of the source fluids in the Grass Valley area, where there is a pluton of about the right age for those gold deposits, but the conclusion here is that the fluids were (broadly speaking) metamorphic and regional and not magmatic in origin. Emphasis here was that the emplacement of the main gold deposits was presumably tectonic as the 130-120 Ma range is in a classic magmatic lull; the main event described in the talk was the separation of the Klamath Mountains from the Sierra. However, the story of a magmatic lull from 140-120 Ma took a blow when Jason Saleeby reported on ages from basement cores from under the Central Valley. The mafic plutonic rocks from under the sediments of the Great Valley Group fall right into that 140-120 Ma gap. So there was a magmatic arc, but it was to the west of the metamorphic rocks of the Sierran foothills. This means that the gold was being emplaced while the region was in the backarc, where heat flow is high, instead of within a quiescent arc. This changes the way we would look at the emplacement of gold; the added heat and the activity of some large fault zones in this time period appears to be the unique combination that led to most of the gold emplacement of the Mother Lode. UPDATE: they have a paper in the November 2014 GSA Today on this, which provides more detail than the tlk. Another interesting talk at GSA came from Richard Becker, a PhD student with Basil Tikoff. Tikoff’s group had identified a peculiar set of fractures in the Tuolumne Meadows area, what they called tabular fracture clusters that are kind of shattered zones up to about a meter wide. Tuolumne Meadows is a rather unique piece of real estate, usually called the largest subalpine meadow in the Sierra, and it stands in stark contrast to the rugged terrain immediately to the north in headwaters of many of the tributaries to the Tuolumne River. The previous workers contended that these fractures were caused by the release of fluids as the last phase of the Tuolumne Intrusive suite was crystalizing. In this talk, Becker suggested that the peculiarly gentle topography of the area was because of pervasive sets of these fractures, which weakened the rock and also introduced a structural anisotropy that glaciers might exploit in different ways. As the mapped extent of these fractures suggests that Tuolumne Meadows overlies some of the densest arrays of these fractures (much of the area is covered by till), it seems plausible that these play an important role in creating the broad gentle area of the meadows. Becker suggested this was not simply a product of the rock type, noting that a similar end-stage intrusion farther south lacked such gentle topography and also lacked many such fractures. Be-10 ages from Dühnforth et al, Geology, 2010, around Tuolumne Meadows. POTD is Pothole Dome (west edge of meadows on the road),LEMD is Lembert Dome. This is an interesting idea, but there are some issues that crop up. 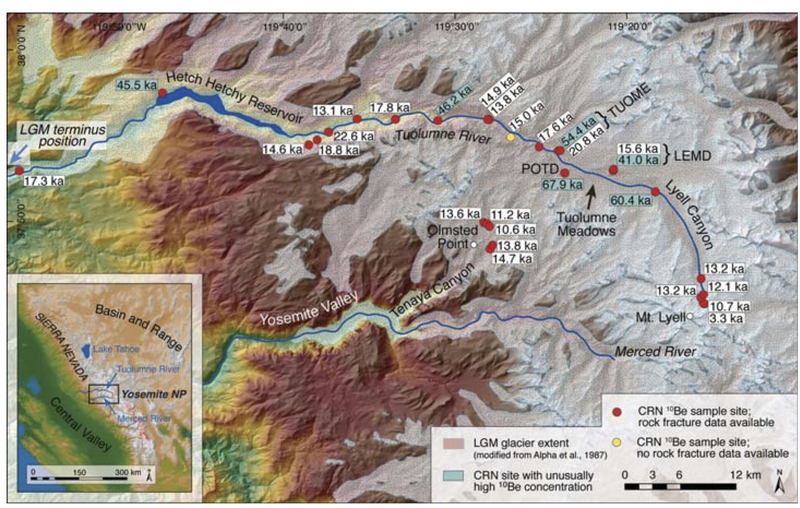 Glaciers are really good at digging well below any sills in their path, unlike rivers that cannot cut below a base level (this is why there are fjords and deep alpine lakes); if this rock is really that weak, shouldn’t Tuolumne Meadows be seriously scooped out? Maybe it is and there is a lot more sediment there than seems apparent. Similarly, if this weakness extended out some distance, the glaciers would clearly have carved down deeply, as is seen just to the west in the Grand Canyon of the Tuolumne. Ironically it seems like an absence of erodibility, not an excess of it, that defines this area, as was documented by Dühnforth et al.in Geology in 2010 (image above). 10Be dates predating the last glacial episode (outlined in blue) mean that only 2-3 m of rock could have been removed in the last glacial episode. Presumably this doesn’t say anything about how much of the fracture-riven rock was removed, but it does suggest that glaciers are probably not creating Tuolumne Meadows. There are other features in the Sierra that resemble the topography of Tuolumne Meadows, none nearly as glaciated. Monache Meadows in the southern Sierra is a broad upland on the South Fork of the Kern River that has very little relief (and much of the area around it is similarly subdued despite high elevations). Horseshoe Meadows is somewhat smaller and a bit bumpier but also kind of odd looking. While there are many canyon flanks that are very gentle (look at the area south of the Clark Range on the north side of the San Joaquin River, or the Chagoopa Plateau along the Kern River), on main stem rivers the other interesting candidate is the region near Courtright Reservoir on the North Fork of the Kings River. Perhaps the answer will turn out to be rivers rather than glaciers; perhaps the fracture sets greatly air river erosion in ways that create these broad low relief areas, but glaciers traveling across these zones have little traction and so, unless the bedrock is more fractured in a traditional way, do little damage. At the Geological Society of America meeting in Vancouver and was mildly amused at the latest name game, the identification of “relamination.” Aside from being a very ugly word (it is an attempt to play off of “delamination,” itself not the height of elegance and rarely applied properly–it should refer to a peeling away of material), are we playing with some new ideas? Mostly, no. The term is not that new (Brad Hacker was using it in 2008, for instance) but seems to have reached that magical point (as delamination did awhile back) to become a geological meme. It appears to have been inspired by observations of ultrahigh pressure (UHP) minerals (like diamond) in “crustal” rocks, suggesting subduction of continental crust to great depths, though by what seems to be the touchstone paper by Hacker et al., in 2011 the requirement for UHP minerals was gone (though still a prominent observation). 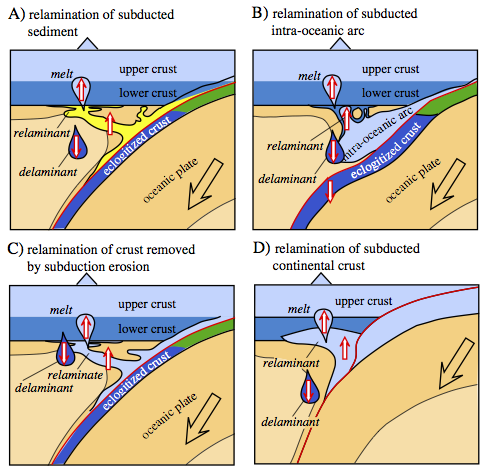 Anyways, the idea of crustal material descending to some great depth in a subduction zone results in the material, being less dense than the surrounding mantle, then rising up as a diapir to join the base of the continental crust, where it might well be incorporated into melt that becomes granitic plutons and silica-rich volcanic rocks. If in this process the silica-rich component is separated from the silica-poor component, it would arguably qualify as a new way to extract continental crust from the mantle. However, much of the application of the term seems simply a way to apply a new buzzword to an old issue: how much continental material that is subducted is simply added to the upper plate? Suggested ways material can be “relaminated” onto crust, from Hacker et al., EPSL, 2011. Science is being attacked from lots of quarters (the most grievous being in Congress), so it seems funny to pick on a defense of science. Yet, you know, the advantage of being grumpy is, well, you can grumble about anything. The piece in question, a post (op-ed?) in the New York Times by George Johnson, points out that scientists are being stymied by native peoples in various places; he particularly points out some Hawaiian opposition to the 30 m telescope for Mauna Kea and repatriation of Indian bones and artifacts to tribes. How bad is this? “The most radical among [Native tribes] refuse to bow to a science they don’t consider their own.” Er, when did we mandate that all must bow to the great god Science? This is the kind of help that is, well, unhelpful, and every bit as insensitive and tone-deaf as calls to enforce political purity on scientific research. He compares this to teaching creation science in science class, which scientists vigorously oppose. Um, sorry, it is not. A science class is a science class, so science is what should be taught; the equivalent to that is, say, reading Darwin (or the Karma Sutra) in a Southern Baptist Bible School, not opposing scientific occupation of a perceived sacred site. The equivalent to arguing against siting a telescope on land valued for other reasons? That might arguing against the Dean killing the major you teach because the other majors need the resources you use: you are welcome to protest and argue, depending on the quality of the argument, you might win or lose. There is a very real and highly sensitive tension between Native communities and archeologists and paleoanthropologists. David Meltzer’s First Peoples in a New World: Colonizing Ice Age America addresses this tension in detail and is far more nuanced than the sledgehammer approach in the NY Times piece. To simply assert that science should always be the victor in these disagreements is like saying that the government is always right. Why are we repatriating remains from museums? Because in many (not all cases), we do know who these belong to, because they were taken without permission to start with, because, usually, because it is the right thing to do. Now something like Kennewick Man might be a different case, and the tangled web of that find and the court cases developed out of that do little credit to those involved on both sides. Does this mean that Native tribes might shield some of their history from scientific research? Sure. Is it being done by people who have little or no respect for scientific knowledge? Can be. Does it deprive all the rest of us of some knowledge? Yes. The key is, is the acquisition of that knowledge more important than the injury done to the tribes from whom the knowledge is derived? Look, we live in a multicultural age. Science is but one of many interests competing for money, space, resources. You can oppose something for any reason you want; that is your privilege in our society. You cannot demand or deny all on your own; there has to be some balance in our society between competing claims. Just as those demanding that we teach all children the Bible and creation science are not recognizing this, so are those who would have scientific needs trump all others. Yep. That is where the chair of the House Committee on Science, Space and Technology wants to take us. Moving now beyond ridiculing grants he doesn’t understand (a popular activity that goes back at least to Sen. Proxmire’s Golden Fleece awards and, in some ways, back to a California legislator reading the Paleontology volume of the California Geological Survey on the floor of the California House in the 1860s), Chairman Lamar Smith of Texas has demanded access to the reviews of successful National Science Foundation proposals that, it appears, he personally doesn’t like. To say this puts a chilling effect on all NSF activities is putting it mildly. Since the committee has not made clear what, precisely, they are looking for (other than “waste”), it isn’t clear how access to proposal reviews and internal judgements is going to do to reduce such waste. Ironically, Congress itself is certainly a source of some true waste, if by waste we mean funding something other than the best science proposed. Programs to direct research funds into states that don’t get much research funds allow uncompetitive proposals to be funded (EPSCoR). Program directors within NSF seem to be aware of how well their funds are being distributed geographically. Continued emphasis on misguided “broader impacts” reduces the emphasis on groundbreaking scientific research, substituting a number of questionable activities that, arguably, would be better provided elsewhere (e.g., training of K-12 teachers by research scientists is often a laughable if well-intentioned affair with little real long-term impact). So, Congress, if you want to reduce the waste in NSF in the sense of not funding the best science being proposed, there might be some good places to look, but the current witch hunt doesn’t appear to have any decent targets in mind. What would be the result of this? The grants in question are unlikely to be terminated. Even if Congress does nothing, there are repercussions. Presumably NSF program directors, who have tremendous control over the process, would look to avoid funding something Smith might inquire about. (Don’t believe that program directors have much control? Ha. Having had members of a panel come to GG and ask how that new research program was going and having to tell them it wasn’t funded yielded the information that the proposal was number 1 out of the panel, which means that the program director killed it). Some reviewers could decline to review for NSF. Look, NSF funded science is a use of federal funds and oversight to avoid, say, spending grants on vacations and a new house is perfectly valid. Controversies over how overhead was being spent were appropriate if unpleasant. Deciding that Congress wants to elect not to fund certain fields is, well, Congress’s privilege (last GG heard, there wasn’t a program in astrology, for instance, though you have to wonder if that is coming soon). Trying though to micromanage research funding to only get the answers you want to the questions you want asked? That’s what think tanks like the Heritage Foundation are for. Please leave NSF out of it. Its hard to remember more than 14 years ago when science and NSF generally did better with Republicans than Democrats. Remembering that Smith was put in charge of the Committee by Republican leadership, if ever there was an argument for the entire scientific community to vote Democratic, this would be it. What exactly is the intent of putting an anti-science ideologue in as chair of the committee overseeing science if not to eliminate science from the federal government? Now this is an interesting paper, but a few points are in order. First, this is a record from one spot; there is considerable evidence that during a reversal, while the dominant dipole field decays towards zero, higher order fields (like an octopole field–one with 8 poles instead of the 2 of a dipole field) remain. What this means is that a reversal in one place might be at a different time or rate than another owing to the dominance of the higher order field terms; the reversal process overall could still be taking a longer time (1000 years is a pretty typical result from models and observations). This locale could just be sitting at a spot where you don’t see the directions wander about as much as other places. Second, as the press release somewhat grudgingly notes, there is no evidence in the fossil record for extinctions associated with reversals. It has been a popular idea widely tested and so far, nothing has stood up. Since there are the higher order fields present during a reversal, it isn’t as though there is no protection at all on the surface of Earth during a reversal. And while energetic particles from the Sun might be more common, it is worth noting that the ozone layer would still be there protecting from UV light.